Zero Gravity Corporation’s Weightless Lab served as a valuable testing ground for the United States Air Force Academy (USAFA), supported in part by Texas A&M University (TAMU) Construction Science Department, as they evaluated the FalconSAT-X on a zero-gravity flight that occurred on November 13 — tThe parabolic flight experiments raise readiness levels for launches such as the December 3rd FalconSAT-6 with SpaceX. ZERO-G Weightless Lab provides a unique opportunity allowing researchers to conduct hands-on testing at a level matching NASA’s rigorous standards and procedures. On the research flight, students and cadets worked side by side to evaluate the in-flight motion performance of solar panels attached to FalconSAT-X, the next satellite to be built by USAFA which is currently in the conceptual design phase. G-FORCE ONE®, ZERO-G’s specially modified Boeing 727, provides a unique platform for student groups, universities, commercial companies and more to test research and equipment bound for the International Space Station and beyond. By using a parabolic flight pattern to produce 30-second periods of microgravity, including Martian and Lunar gravities, ZERO-G gives researchers the opportunity to conduct hands-on testing and collect data in-person. The special lab conditions allowed researchers to easily observe experiment outcomes without interference from friction or other disturbances. Though each research group worked on independent experiments, they collaborated in post-run data collection. U.S. Air Force Academy cadets clean the components of the FalconSat-6 satellite they and their instructors built at the Academy at Vandenberg Air Force Base, California, this month. Photo is courtesy of U.S.A.F. Dr. Patrick Suermann, TAMU Construction Science Department Head and USAFA Alum, flew with the USAFA students as they deployed the tests during a series of 25 parabolic arcs offered during the flight. 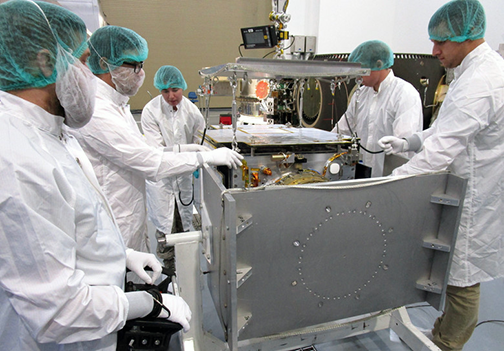 In addition to recording the general performance of the deployment and retraction of the solar panels attached to their test satellite, team members were able to observe the motion and vibration induced by moving the panels. On each run, the team would initiate the panels to either open or close depending on the sequence. Testing the FalconSAT-6 smallsat in the Zero-G lab environment. For additional information about the ZERO-G research program and how to participate during the March or November 2019 flights, please visit www.gozerog.com and click on the Research Tab.